Daohong Zhou, M.D., received a $1.8 million NIH grant to support his research on a therapy to prevent and possibly reverse a lung disease found in patients who undergo radiation therapy for cancer. Oct. 23, 2017 | LITTLE ROCK – A scientist at the University of Arkansas for Medical Sciences (UAMS) has reached a status few achieve by being awarded his third concurrent R01-type Research Project Grant by the National Institutes of Health (NIH). Daohong Zhou, M.D., received the $1.8 million grant to support his research on a therapy to prevent and possibly reverse a lung disease found in patients who undergo radiation therapy for cancer. Zhou is associate director for basic research in the UAMS Winthrop P. Rockefeller Cancer Institute. “In this era of extreme competition for NIH grants, it’s very uncommon for an investigator to have three R01-type Research Project Grants. This accomplishment speaks to the significance of Dr. Zhou’s research and the confidence his peers have in his ability to accomplish the goals outlined in each of the projects,” said Lawrence Cornett, Ph.D., UAMS vice chancellor for research. R01-type Research Project Grants are the original and oldest grant mechanism used by NIH. Since 1992, only 27 UAMS faculty members have held three or more concurrent NIH Research Project Grants, including R01 and other grant mechanisms. This award puts Zhou’s current NIH funding at more than $5 million and marks the second time he has held three concurrent R01-type grants, with the first being in 2010. To illustrate the competitiveness of the grant process, the NIH reports a total of 30,106 applications received for R01-type grants in 2016. Of those, only about 6,000 were funded, for an average award of $458,287. Zhou’s research aims to revolutionize the management of radiation-induced pulmonary fibrosis (RIPF), one of the most damaging side effects resulting from radiation therapy to the chest. For some people, the signs of RIPF may not appear for months or even years following radiation therapy and can cause shortness of breath, coughing, fatigue and other symptoms. Severe complications can lead to lung failure. There is no drug therapy available to prevent or reverse RIPF, and treatment options are often limited to easing symptoms. One of Zhou’s research goals is to develop a safe and effective treatment for RIPF using senolytic drugs, which are designed to selectively kill old or senescent cells. Use of such drugs could alter the course of RIPF by providing the first treatment available for the condition. “Our research team is examining whether cellular aging, also called senescence, is primarily responsible for initiating the development and progression of radiation-induced pulmonary fibrosis. 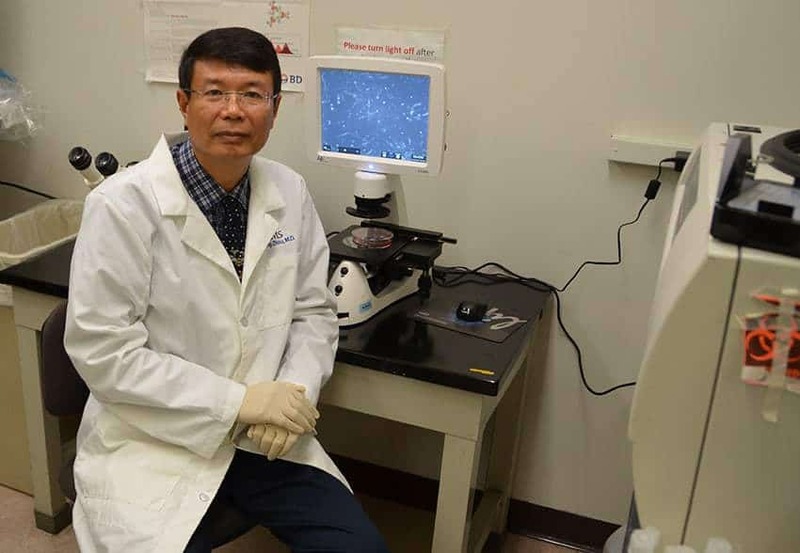 If our hypothesis holds true, clearance of the old cells could not only prevent or delay disease progression, it also could reverse existing tissue fibrosis even after it has begun,” said Zhou, also a professor of pharmaceutical sciences and deputy director of the Division of Radiation Health in the UAMS College of Pharmacy’s Department of Pharmaceutical Sciences.